As the Evian Championship gets underway on the shores of Lac Leman I'll be writing about my travels there earlier this summer. 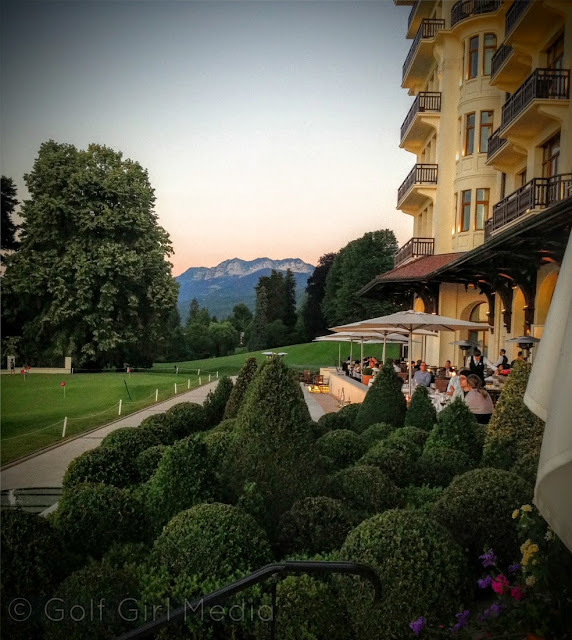 Arriving in Geneva, Switzerland on a sweltering afternoon in early July, the prospect of a lakeside Hamlet nestled in the foothills of the nearby Alps had an exceptional allure. We'd departed from Paris that morning on a high speed train from the Gare de Lyon, leaving behind the bustling Gallic metropolis for a three hour glide through the French countryside in a bubble of air conditioned comfort. The trip featured lunch with wine and spacious well-designed seats. More precious to me however, and the reason I'd recommend making this trip by train, are the enchanting glimpses of rural France that present themselves continually as one travels towards the Swiss border. Our débarquement was somewhat jarring after the cool, cloistered reverie of the train ride. Gare de Cornavin, Geneva's central station, was teeming with tourists and travelers. It was a Sunday and a myriad of summer festivals were underway in the city. It took us several minutes to spot our good friend Sam. He emerged suddenly from the sea of disembarking passengers and led us to his stylish Citroen parked in the underground lot. Sam, a Connecticut neighbor, is currently on the second year of a two year assignment in France. His chalet in nearby Thonon would be our home base for this Alpine adventure. Our itinerary was vague by design. We'd make plans spontaneously based on the weather and our daily whims. Golf would be involved, we knew that. Years of following the Evian Masters and the Evian Championship had made the Evian Resort Golf Course a must-play in our minds. So, on that first balmy evening in Haute-Savoie, we dropped our bags at Sams place and took the 20 minute drive into Evian. The town, with its lakeside setting and ornate architecture is whimsically romantic. Belle Epoch buildings and formal gardens come together to create what sometimes seems like a Proustian theme park. Our destination this first night was the lake view terrace at Evian's Hotel Royal where we enjoyed a spectacular sunset and champagne cocktails. The emerald putting green was an alluring accent. It was, we agreed, the perfect introduction to Évian-les-Bains.